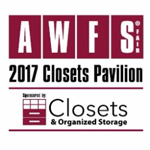 AWFS®Fair announced the addition of a Closets and Home Organization Pavilion at the upcoming AWFS®Fair (July 19 to 22, 2017) which will be co-sponsored with Closets & Organized Storage magazine. The pavilion will have its own designated area in the Las Vegas Convention Center, on the AWFS Fair show floor, and is accompanied by educational sessions focusing on custom closets, garages, and organized storage. These sessions will be featured as part of the AWFS®Fair College of Woodworking Knowledge® (CWWK®) curriculum. Kicking off this bold, new initiative, The Woodworking Network will produce a full day Closets & Organized Storage Symposium on Tuesday. “In the day prior to the opening of the exhibit hall.th July 18 2017, organization is at the forefront of consumer trends, driving new opportunities for designers, suppliers, and manufacturers,” said Laurel Didier, Publisher of Closets & Organized Storage magazine. “We are pleased to partner with AWFS®Fair to offer a premier education event for this dynamic segment of the robust and growing wood products manufacturing industry.” Laurel added further. AWFS®Fair also announced that it has sold out the supplier portion of the exhibit hall (and 90% of the entire show floor) for the 2017 Fair and has designated additional space for supplier companies which will be located near the Closets pavilion.